Long before I ever stepped foot on the Colorado campus, and way before fans were rushing Folsom Field in 2016, I remember sitting at my house in Denver pondering my future. I was a senior in high school and my football career had just been turned upside down. Recruitment had been a long and difficult process for me, but on this particular day I remember feeling like everything was finally coming back together. I had gone through a nasty knee injury during my senior season a few months before, putting my career at risk, but when CU assistant coach Jon Embree visited my house that day, I felt optimistic that my future was starting to take shape. 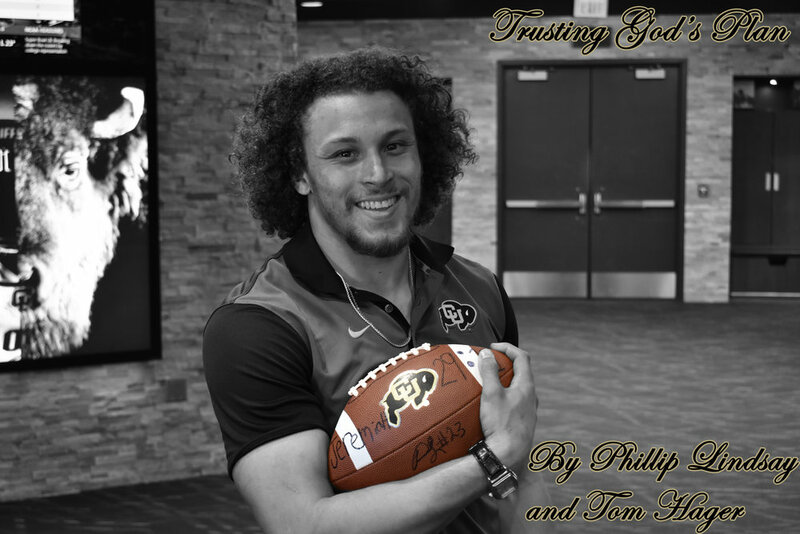 As Jon said his goodbyes and headed back to Boulder, I knew I was going to be a Colorado Buffalo. Twenty minutes later, not even halfway back to campus, Jon had been fired. As I sympathized with what Jon and his family might be going through, my focus eventually shifted toward my future. Where was I going to get an education? How was I going to pay for it? Did anybody even want me on their football team? I was a scared 17-year-old staring at a life that had more questions than answers. My life was filled with uncertainty, except for one thing - God had a plan for me. Through all the mystery of what the next few years of my life held in store - and why all of this was happening - I never felt abandoned by God. I knew all along that this was part of His plan, but more importantly, that this was a test. He puts you through tests that He feels are necessary to make you become the man or woman that you need to become, and this was going to be part of my journey and my story. We go through these situations so we can figure out who we really are, and for me it meant that learning that life isn't all about me. It's a beautiful lesson, but that doesn’t mean getting there is always easy or fun. For much of my life, I was the guy people came to see on the football field. As I prepared for my senior season, I had a real chance to become the leading rusher in the history of Colorado High School football. I had rushed for 4,288 yards and 42 touchdowns in my first three seasons, and my final year was shaping up to be no different. Then, in one play, everything changed. I didn't just hurt my knee - I blew my knee out. I had given my verbal commitment to Colorado, but that hardly meant they owed me anything. I knew that I would have to work hard to ever see a football field again, but if that ever happened it would be months or years away. In the meantime, my high school teammates were rallying around my injury and winning games. And at first I did not handle it well. At times I felt lonely, and for the first time I felt vulnerable. To my siblings, I am this invincible athlete who can do no wrong. But now I'm questioning what I really have to offer, and the answer didn't feel very obvious to me. I can't even remember how many times I cried. That's when God taught me one of his most important lessons - that it's not about me. It was a long overdue lesson that I needed to learn. God is going to humble you - regardless of whether it's in football or life in general - you are going to be humbled at some point. But once we realize that we can't do everything on our own, we start to realize that we need God in our lives. He gives us these abilities to do great things, and He can take that away as fast as He has given it to us. God eventually did give me my abilities back, but not before allowing some of my teammates to shine. With the focus no longer on me, a few of my teammates from Denver South High School were able to gain the spotlight and earn Division 1 scholarships. They reached the state championship in my absence, and I got to see how awesome it can be when players persevere through rough times. It was a lesson I am glad I learned before I arrived in Boulder.